 Today we accepted a new gibbon at the IPPL sanctuary! Howdy, Spanky! Welcome to IPPL! Shirley (and all of us!) were very excited about Spanky’s arrival! 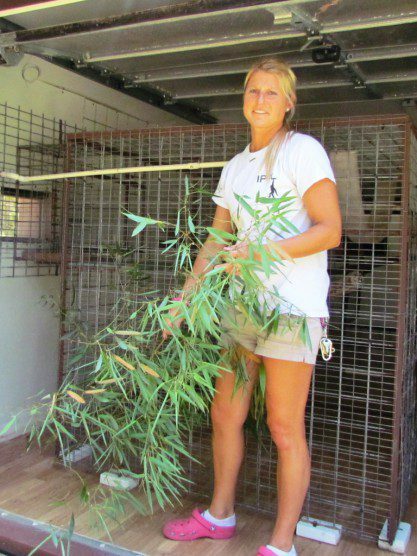 Meg our senior animal caregiver got some fresh bamboo ready for Spanky. Spanky is an eight-year-old male, born October 18, 2005. He’s a white-handed gibbon from Texas who was given to his former “owner” as a gift when he was only eight months old. However, in March his owner contacted us, saying that she was no longer able to care for him because of her health problems and that she was trying to find a suitable “forever home” for this handsome little guy. Shirley and Spanky get their first good look at each other! 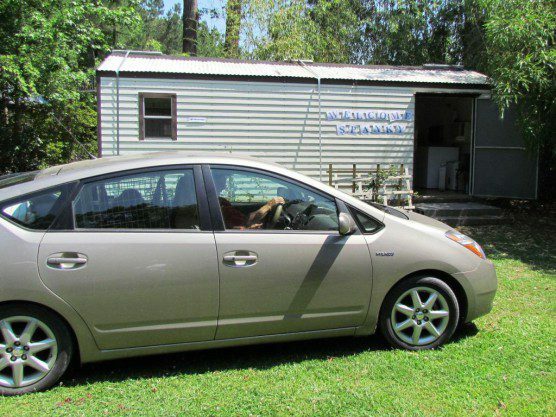 Spanky is driven up to his quarantine house, his home for the next month. 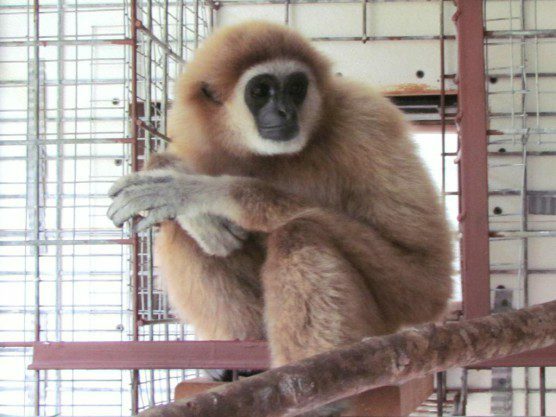 Spanky is a lovely, healthy-looking little gibbon. 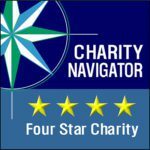 But, as is true of many ex-pet primates, Spanky has already had dental extractions—in his case, all four of his canines have been removed. According to his former owner, Spanky enjoys watermelons, bananas, grapes, and sweet potatoes but dislikes cucumbers and squash. He also likes blackberries. His owner’s husband told us a story about how once the two of them went blackberry picking with Spanky in a four-wheeler some years ago and how Spanky kept stealing blackberries from his owner’s coffee tin. They only realized this when they noticed no berries in the tin but a very contented Spanky sitting nearby with a purple mouth. As it happens, we have blackberry vines growing just outside his quarantine house! Lucky for Spanky, there are blackberry vines growing right outside his quarantine house! We have been warned: he likes to steal hats and glasses (he isn’t called Spanky for nothing…). He also enjoys cuddling with a blanket, so we have provided him with one. And, as we saw today, he loves being groomed. 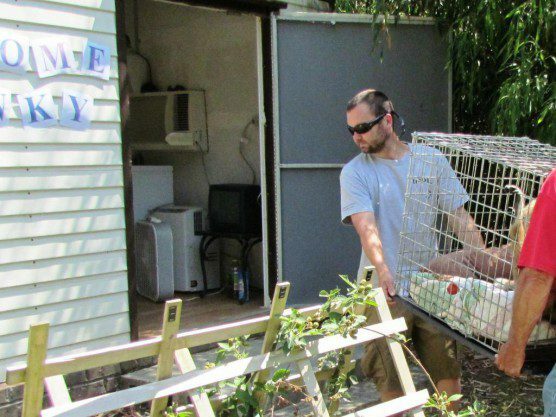 Our caregiver Brandon helps lift Spanky’s travel crate into our quarantine house. Gibbons can live to be 50 years of age or more (like IPPL’s Igor, Blackie, or Gibby), so young Spanky could well outlive any of us humans with him today. That’s why we know that accepting him for permanent care is a serious undertaking, and not one we ever do lightly. 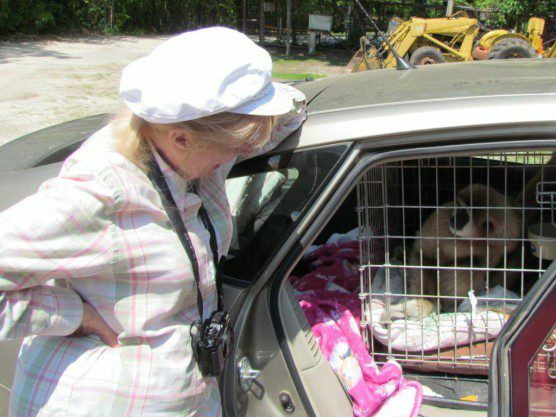 Spanky’s arrival brings the number gibbons at the IPPL sanctuary to 37. Now we just need to be extra-alert for an unwanted gibbon gal out there to keep him company…. Spanky, it’s a whole new world out there for you! OH, What a sweet little boy. I can’t wait to meet him in the Fall. He is very beautiful. Spanky is doing very well since his arrival. He has picked up the routine as if he has lived at IPPL his whole life. He is super sweet and comes over for back scratches every time he sees us from afar. So far, he loves the fresh, yellow champagne mangoes and cantaloupe. He enjoys watching Helen and Peppy, his neighbors, swing in their enclosure. I think he will love his new home. 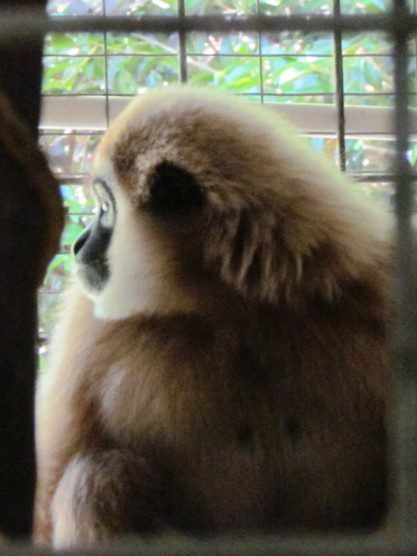 Spanky is an awesome gibbon! He is super sweet and loves to be groomed. Spanky has been enjoying trying all the new foods out here, like kiwi and cilantro. While he is enjoying eating his favorites, like mango and sweet potato, he is definitely willing to try new things! I’m looking forward to meeting this lucky little guy. He will have a great life at IPPL.